Born in New York City, Van Rensselaer received her early education from tutors and governesses. She moved with her family to Germany in 1868, remaining there for five years. Van Rensselaer began her writing career in 1876 after returning from Germany to reside in New Jersey. She was a regular correspondent for the American Architect and Building News, an art critic for various New York newspapers including the Independent and the World, and contributed to the American Art Review and Century Magazine. In 1883 Van Rensselaer interviewed Frederick Law Olmsted, Sr., and H.H. Richardson for a Century series on “Recent Architecture in America.” Taking inspiration from Olmsted and Richardson, she encouraged architects to sensitively build according to the nature of the site. Olmsted was among those who convinced her to write Henry Hobson Richardson and His Works (1888) after Richardson’s death. In 1887 Van Rensselaer published a summary of the Olmsted and Vaux “General Plan for the Improvement of the Niagara Reservation” in the Century, and wrote articles and editorials for the journal Garden and Forest. She soon began ten years of focused writing on landscape architecture. In 1893 Van Rensselaer published Art Out-of-Doors, which included her seven-part landscape gardening series and several of her unsigned Garden and Forest editorials. She published a new edition of the volume in 1925, which featured an additional chapter about changes within the field of landscape architecture, which had become more ambitious and versatile, as well as the popularity of automobiles, which were beginning to affect recreation and rural and urban planning. Van Rensselaer passed away at the age of 82 at her home in New York City. Mrs. Schuyler Van Rensselaer is considered one of the visionaries of the American aesthetic movement—an interlude of cultural expansion and experimentation in the Gilded Age. She was one of the critical minds occupied with the subject of art at a time when, to an unprecedented degree, the country was interested in all matters pertaining to art. And in her mind, art included architecture and landscape architecture. A woman of high breeding, Van Rensselaer held a position in New York’s top social and cultural echelons and mingled with authors, artists, and affluent patrons of the arts. Despite her elite status, Van Rensselaer considered herself a professional, and used these privileged opportunities to review art exhibits and to write in-depth studies of American and European artists, ranging from H. H. Richardson to Frederick Law Olmsted and Jean Baptiste Camille Corot. Not content to be a mere visitor of exclusive summer colonies and continental cities, she wrote about their history, art, architecture, and gardens. Mariana Griswold was born into a family of wealthy New York City merchants on February 23, 1851. 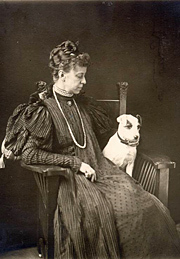 She was one of seven children who grew up with tutors and governesses in a grand house on Fifth Avenue. In 1868, she moved with her family to Dresden, Germany, where she remained for five years. Van Rensselaer took full advantage not only of Dresden’s many cultural attractions, but also of the rich offerings of other continental cities, becoming fluent in French and German and fluent in the requisite languages of art, architecture, and landscape criticism. With connections to the German natural historian Alexander von Humboldt, Charles Darwin, botanist Asa Gray, geologist Nathaniel Southgate Shaler, and naturalists Henry David Thoreau and John Burroughs, Van Rensselaer was able to combine an aesthetic sensibility with scientific knowledge. Her engagement in the study of nature led to an abiding interest in botany and geology—and allowed her to use those sciences to address all aspects of landscape architecture. Van Rensselaer’s writing career began early in 1876 after she returned from Dresden to live in New Brunswick, New Jersey, with her new husband Schuyler. Their only child was born in February 1875. Van Rensselaer found time for writing despite her family and social responsibilities. She was a regular correspondent for the American Architect and Building News, the art critic for the New York newspapers the Independent and the World, and wrote articles for the short-lived American Art Review. In 1882 she began writing for Century Magazine. Like Van Rensselaer, the landscape architect Frederick Law Olmsted had a connection with Century’s editor, Richard Watson Gilder, and was part of the set that wrote forthe magazine. Although Van Rensselaer and Olmsted had friends and interests in common, they did not meet until the fall of 1883, when she traveled to Brookline to interview H. H. Richardson and Olmsted for a nine-part series for Century on “Recent Architecture in America.” The successful collaboration between Richardson and Olmsted remained an exemplar for Van Rensselaer, and she encouraged architects to build appropriately with regard to the nature of the site. After Richardson’s death, Olmsted was one of the men who convinced Van Rensselaer to write Henry Hobson Richardson and His Works (1888). In 1887, Van Rensselaer became involved with Olmsted’s struggle to establish a Niagara reservation in New York. He was delighted that she had been inspired by the “General Plan for the Improvement of the Niagara Reservation,” which he had authored jointly with Calvert Vaux. He asked Van Rensselaer to translate the substance of the Niagara report and boil it down to “a palatable popular plateful.” She agreed to Olmsted’s appeal and published a summary of the report in the August issue of Century. Soon after, Van Rensselaer began what was to be ten years of concentrated writing on landscape architecture. In the remaining months of 1887, she prepared articles and editorials for a new journal called Garden and Forest. Charles Sprague Sargent, Harvard Professor of Horticulture and Director of the Arnold Arboretum, was founder and “Conductor” of the new weekly, subtitled A Journal of Horticulture, Landscape Art and Forestry, which began publication on February 29, 1888. An examination of the editorials (all unsigned) reveals that, in addition to authoring numerous articles, Van Rensselaer was the female editorial voice of Garden and Forest. One of her most valuable contributions to the journal was a seven-part series which outlined the artistic principles of landscape architecture, which she defined as “the [fine] art whose purpose it is to create beautiful compositions upon the surface of the ground.” The influence of Olmsted was evident, yet Van Rensselaer was not strictly faithful to his ideas. She discussed issues such as the proper nomenclature for the profession (unlike Olmsted, she preferred “landscape gardening”), and the similarities between the artistic creations of the landscape gardener and the idealist painter. Van Rensselaer contributed another series to Garden and Forest: twenty-one historical essays on “the art of gardening,” which looked at gardening, “as an individual and independent manifestation of the artistic instinct, yet one which has . 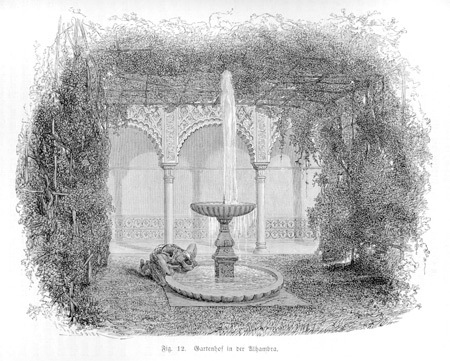 . . a vital relation to the general course of human development.” Among the garden traditions covered were Japanese, Egyptian, Persian, Greek, Roman, and Moorish gardens in Spain. The year 1893 was significant for the country and for Olmsted and Van Rensselaer. The Chicago World’s Fair opened in May on a site that had been transformed by Olmsted. Thinking the fair “the great sight of the century,” Van Rensselaer wrote about its attractions for Century and for the Rand, McNally & Co.’s Handbook of the World’s Columbian Exposition. In the fall, just as the fair was closing, she honored Olmsted with a laudatory profile in Century. 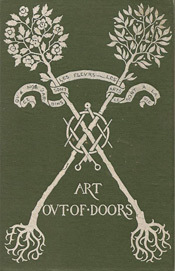 Van Rensselaer’s Art Out-of-Doors was also published in 1893; for this volume, she reworked her seven-part series on landscape gardening and added several of her unsigned Garden and Forest editorials. A new edition of Art Out-of-Doors with additional material appeared in 1925. Rather than alter the original text, Van Rensselaer added a supplementary chapter entitled “Changes.” She believed that in the preceding 32 years, landscape architecture had become a more ambitious and a more versatile profession. One development was of particular interest to her. The motorcar, Van Rensselaer remarked, now permitted “everybody and his wife and child to go a-wheel,” to leave the city on extended tours, or at least on Sunday excursions, and she recognized the need for landscape architects to deal with the automobile’s effect on recreation and on city and rural planning. Art Out-of-Doors is Van Rensselaer’s most recognized contribution to the field of landscape architecture and to the gardening public. The book became required reading for James Sturgis Pray’s introductory course in landscape design at Harvard; Cornell and the University of Illinois also listed the book as a course requirement. After establishing a program of Landscape Design for it members, the National Council of State Garden Clubs republished the 1893 edition in 1959. Although Van Rensselaer was not a designer, she had a profound appreciation and understanding of landscape architecture. Educating people, she once remarked, was one of the two things worth doing in the world—and she succeeded. Her historical and critical writings on landscape architecture would educate generations of students, amateurs, educators, and practitioners. Van Rensselaer died a month before her 83rd birthday at her home, 9 West Tenth Street, New York. Van Rensselaer, M. G. “Recent Architecture in America: American Country Dwellings I.” Century 32 (May 1886): 3-20. [Van Rensselaer, M. G.] “The Niagara Reservation.” Century 34 (August 1887): 631-633. Van Rensselaer, Mrs. Schuyler. Art Out-of-Doors: Hints on Good Taste in Gardening. New and Enlarged Edition.New York: Charles Scribner’s Sons, 1925. Major, Judith K. “Mariana Griswold Van Rensselaer’s Landscape Gardening Manifesto in Garden and Forest.” Landscape Journal 26, No. 2 (2007): 183-200. Yanni, Carla. “‘The Richardson Memorial’: Mariana Griswold Van Rensselaer’s Henry Hobson Richardson and His Works.” Nineteenth Century 27, No. 2 (Fall 2007): 27-36. Mariana Griswold Van Rensselaer. Accents as Well as Broad Effects: Writings on Architecture, Landscape, and the Environment, 1876-1925. Selected and edited by David Gebhard. Berkeley, Los Angeles, & London: University of California Press, 1996.